My sister has a pear tree in her yard and she gave me a ton of pears. And also some apples and tomatoes. But with the pears and apples I made this wonderful pie! I cut into it a bit too soon...but it smelled so amazing that I couldn't resist it any longer! I was going to make a few different things with the pears, and there weren't a ton of apples, so I decided to whip up a pie. I haven't made one for a while. 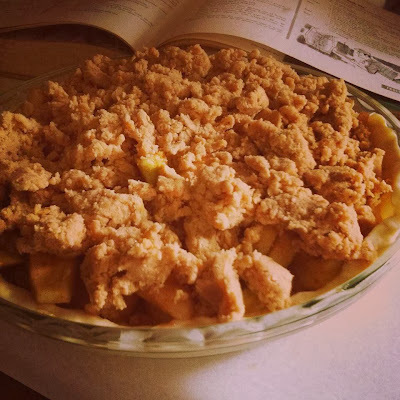 My trusty 1960's Pillsbury cookbook gave me the best pie idea yet (much like the Rhubarb Crumb Pie recipe I got from it). Old recipes are the absolute best. You can see it in the background of the pie before I put it in the oven. The black-and-white photographs are the best. Cookbooks in black-and-white and the food still looks amazing! 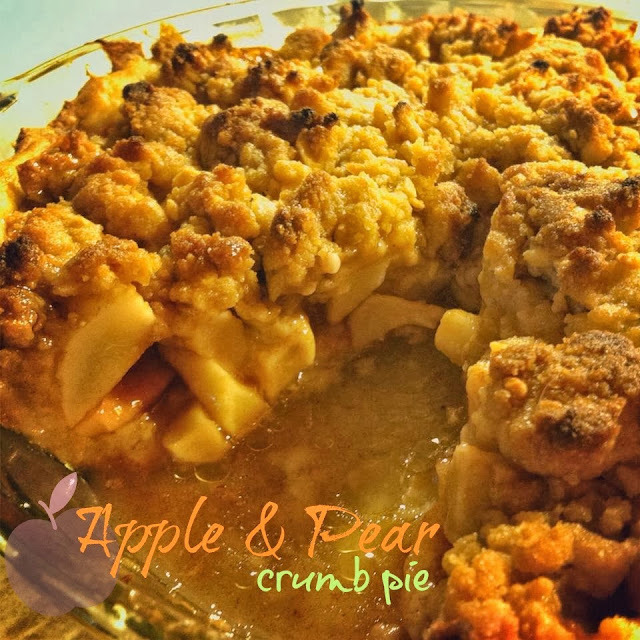 I was going to try a Pearisian Pie, but that calls for applesauce and a double layer pie crust. Two-layers of pie crust just isn't my favorite, I prefer crumb pie any day. Hands down! I made my favorite Cream Cheese Pie Crust for this pie. So I changed things up a bit and this is what I got! In a large bowl combine pears, apples, sugars, and cinnamon until the fruit is well-coated. Pour the fruit into a 9 inch pie plate with an unbaked pie shell in it. Drizzle the 1 tablespoon butter over the fruit. In a medium bowl combine the flour, sugar, nutmeg, cinnamon and butter until the mixture becomes a coarse crumbs. Mix in the chopped peanuts. Add the crumbs over the top of the pie.